The Social Engagement Journey was developed by consultancy firm Ant’s Eye View in 2010. This model focuses on the steps taken to achieve a fully ‘connected’ organization. These steps are part of a ‘journey’ that an organization can go through to reach this full connectedness. According to the authors, all steps are necessary to come to stage 5, the ultimate stage. The second stage usually involves 1-2 individuals or teams who begin experimenting with social engagement. These mavericks can appear in any part of the organization but are often in marketing or support groups. There may be multiple mavericks in a company, but they are not yet connected to each other. Teams in this stage emphasize direct customer engagement, likely breaking or bending internal rules to make it happen. The fourth stage usually means social engagement is delivering real business results. Executive support is broad, and engagement efforts are built into forecasts and annual plans. Customer listening is the norm, and multiple individuals within business units and functional groups are empowered to engage directly with customers and prospects. 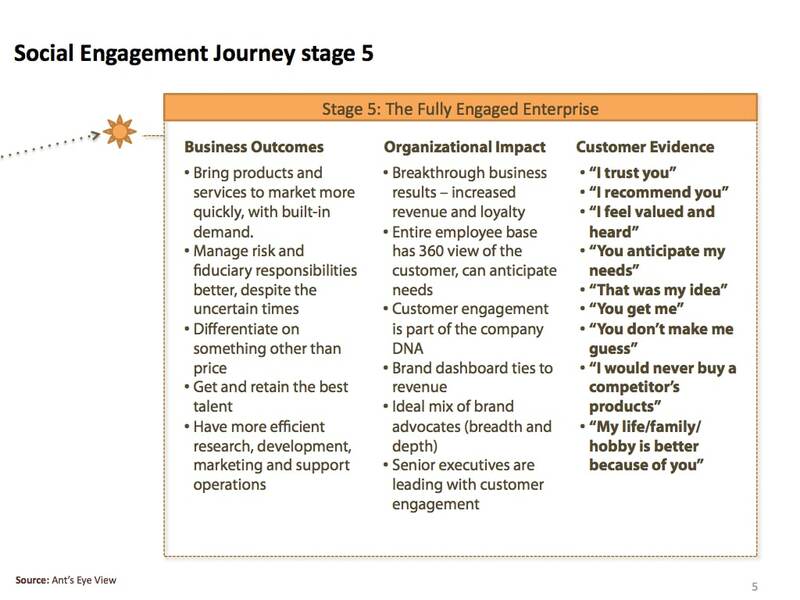 Most companies would feel very satisfied reaching Stage 4, but there is a higher stage of engagement possible. The ultimate situation, step 5, is probably nirvana given that many of the tools to achieve this stage don’t exist yet for enterprise-level companies, but we call it the Fully Engaged Enterprise. In it, companies experience breakthrough business results based on deep customer engagement. Customers say things like “You know what I need before I do” and “my life is better because of you,” or “I trust you.” That said, there’s a lot of foundation work to do in Stages 1-4, regardless of technology.